The Henderson House is a 3,200 sf home, donated to the YWCA by local philanthropist Don McLeod. The single story 5-bedroom/3-bathroom house is the first Transitional Living Center for homeless women veterans and their dependent children in the country. The YWCA recognized a need for some women veterans, who like their male counterparts found themselves homeless after leaving the military. The YWCA then applied for, and received, a capital grant from the Federal Department of Veteran Affairs to cover the costs of construction and renovation so that the house meets the strict Life Safety Code and is ADA compliant. The house can now accommodate up to 10 residents. 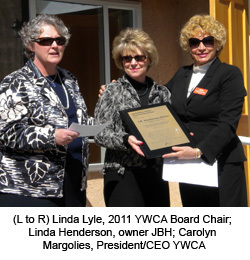 Through our involvement with Rebuilding Together Albuquerque, JBH worked with architects, engineers and subcontractors to provide the YWCA with a cost estimate to obtain the funding required to renovate the home and bring it to current building and ADA codes. 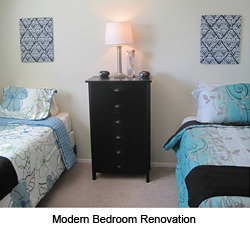 With schedule and budget developed, contracts and funding in place, JBH began the construction and renovation of the Henderson House in October of 2010. Five months later, the Henderson House held its grand opening. Though the YWCA received initial funding from the Department of Veteran affairs, the need exceeded support and the project benefitted from several individual donations made from generous citizens, grateful to these brave women. JBH contributed monetarily to the project with donations pledged from employees during our United Way Campaign and allocated directly to the Henderson House. Philanthropists Mark and Linda Henderson offered additional funding both through the United Way and independently. 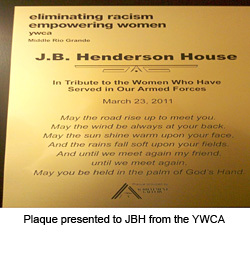 The YWCA expressed their gratitude by naming the house the “JB Henderson House.”JBH served as general contractor for the project, supported by sub-contractors who, like JBH, offered their services for little to no profit. With construction complete, the Henderson House is open to serve homeless woman veterans who make up 7% of the nation’s homeless veteran population. 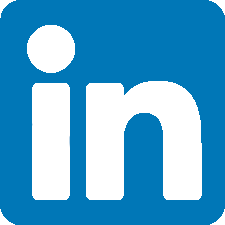 JBH is proud of its contribution to this important project.